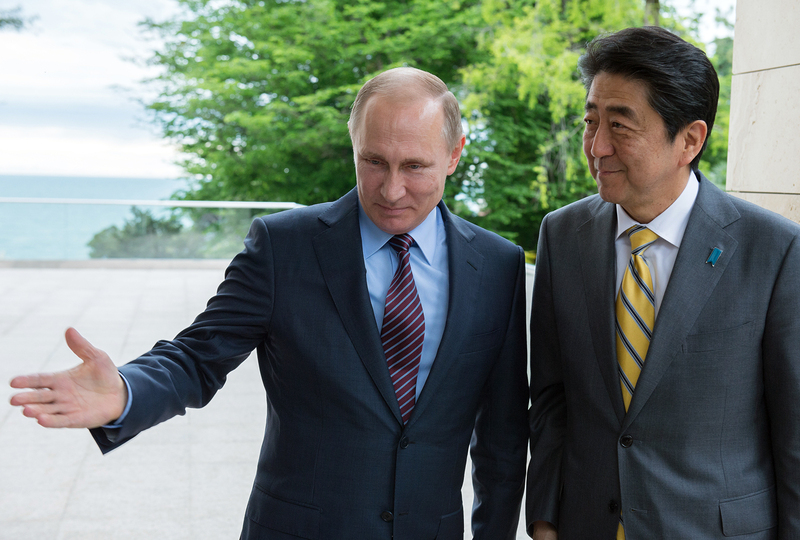 Vladimir Putin with Shinzo Abe in Sochi. Moscow and Tokyo are equally concerned about “losing face” and showing weakness during talks on the territorial issue. This is likely to come in the way of the countries signing a World War II peace treaty when Vladimir Putin visits Japan on Dec. 15-16, according to former Russian Ambassador to Japan Alexander Panov. Concerns over the Russia-Japan summit, which will be held on Dec. 15-16, have been growing since September, when the dates of the summit were confirmed. Both countries fear that something may happen to shake or undermine their “unwavering positions” on the territorial issue. After meeting Putin in May 2016 in Sochi, Abe claimed to have developed a "new approach" to solve the territorial problem, however, he did not disclose its contents. Therefore, when at the Lima press conference the Russian President noted that Moscow is ready to consider various options for the resolution of disputes, the upcoming summit in Japan acquired special weight. The concern of those who stick firm to principle and unchanged positions is clear: the leaders of the two countries meet regularly, talk on the subject of the peace treaty, there are no leaks to the press, so… there might be a chance, that while admiring the beautiful Japanese nature and enjoying exquisite Japanese cuisine in Abe’s home town of Yamaguchi, the leaders might come to an agreement. It is worth noting that false hope has been a part of many such meetings. Such hype existed before the visit of Soviet President Mikhail Gorbachev to Japan in April 1991, on the eve of the failed visit of Russian President Boris Yeltsin to Tokyo in August 1992, and in anticipation of the meetings “without ties” in Krasnoyarsk and Kawana in 1997 and 1998 respectively. And every time the arguments sounded familiar. Will the Russia-Japan 'tug-of-peace' yield any results? The Russian supporters of maintaining status quo put their emphasis on the fact, that the islands of the Habomai archipelago, Shikotan, Kunashir and Iturup became Russian as a result of the World War II. The islands are of high military-strategic importance. Waters surrounding the Southern Kurils are rich in fish and mineral resources. The Japanese argument is more modest, but is as strong as a samurai’s honor: the Islands are originally Japanese territory, recognized as such even in the first Japan-Russia Treaty of 1855, and after Japan's defeat in World War II they were, as Japan says, unjustly seized. Meanwhile, the tone of the Japanese side has begun to change of late. For example, the number of those Japanese who are willing to accept the return of the islands mentioned in the Joint Declaration of the USSR and Japan of 1956 - Habomai and Shikotan - is on the rise. Some in Japan say, that it is necessary to negotiate the peace treaty with Moscow in order to prevent it forming an anti-Japan alliance with Beijing. And after the U.S. elections, many in Japan have started saying that Donald Trump would not object to a Japan-Russia rapprochement that Moscow could use to weaken the Japan-U.S. military alliance. In my opinion, for more than 60 years of the Japan-U.S. alliance, the former became addicted to the latter. The pro-American lobby includes many influential Japanese politicians, public figures, representatives of business circles, the press, and scientists. Abe, who possesses a strategic vision, believes that Tokyo needs to build ties with Moscow even as Sino-Russian relations go from strength to strength. At the turn of the 20th to 21st centuries, several Japanese prime ministers (Ryutaro Hashimoto, Keizo Obuchi, Yoshiro Mori) tried to change the paradigm of the development of Japan-Russian relations. They kept the task of developing the “weaker Japan-Russia link” in the wider context of U.S.- China-Russia-Japan quadrangle. Previous plans failed, mainly because of the opposition of those Japanese politicians who held a pro-American orientation. It is unclear whether Abe and Putin can succeed. On the eve of the summit there were statements from both sides, confirming that neither Moscow nor Tokyo regarded the signing of a peace treaty as an easy task that can be solved in just one summit. The Russian President noted that an agreement on a peace treaty could be achieved through enhanced trust and confidence building measures. He meant that there has not been enough trust so far. We can expect agreements for the implementation of a number of economic cooperation projects in line with Prime Minister Abe's 8-point program of economic cooperation. However, a peace treaty is still a long way off. Meanwhile, both sides need to show through small steps that there is some movement towards a peace agreement. And we can talk about joint economic and humanitarian activities on the disputed islands. The countries need to build relations on different tracks: increasing economic collaboration, developing political connections (on many important international issues, positions are close or the same), establishing contacts between the militaries, and intensifying humanitarian exchanges. And at the same time they should continue negotiations on a peace treaty and look for a solution that can be seen as win-win for both sides. I am convinced that such a solution can be found. Alexander Panov was the Russian Ambassador in Japan from 1996 to 2003. He has also served as Russia’s Deputy Foreign Minister.